Nearly everyone is motivated by positive attention from their managers and peers. Some respond to physical reminders, like a note or a bouquet of flowers. Others will thrive on public recognition at a sales meeting. But some may be embarrassed if their name is called out in public and they are asked to come forward and accept their reward or recognition. That’s why astute managers are sensitive to each person’s personal preferences; and understand that what makes one person tick, may stop another’s clock in its tracks. The best way to show appropriate recognition is to get to know people and reinforce their positive performance with things that are important to them. Sometimes even a card, a note, a fax, recognition for acquiring a new account or simply for maintaining such an upbeat, positive, cheerful attitude, will be the very reinforcement they need. I’m talking about motivation, not manipulation. When only the manipulator wins, somebody else loses. In the business world, as well as in our social and family life, if the other person wins, you win, too. Give it a try. Put it to work, and I’ll see you at the top! 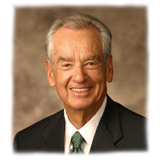 Zig Ziglar was a teacher and motivator. You can receive the Ziglar newsletter filled with more of his inspiring stories as well as practical ideas to help you in the areas of sales, marketing, customer service, and related topics. You can learn more about him at www.ziglar.com.